Unist has expanded its line of MQL lubricants with a new oil specifically formulated for use with aluminum. 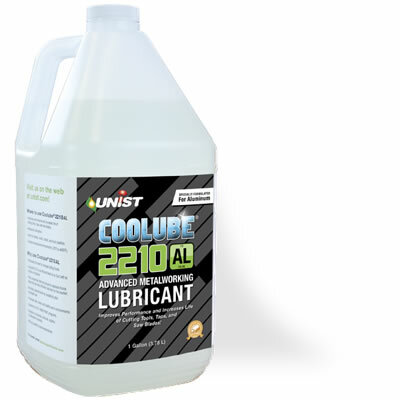 Like all of Unist’s fluids, Coolube® 2210AL aluminum cutting fluid is derived from natural vegetable oils, is machinist and environmentally friendly, and there are no VOC’s. Unist Coolube® 2210AL provides specific benefits when machining aluminum. Testing shows this aluminum bandsaw lubrication oil provides exceptional lubricity and stability under load, which helps improve tool life. Unist Coolube® 2210AL is nearly odorless and does not cause skin, eye, or throat irritation. Using the right lubricant is very important in MQL applications. The perfect lubricant will adhere to the surface of the tool and provide a thin, low friction barrier between the cutting tool and work piece. Studies have shown that Coolube® has superior properties which make it an ideal lubricant. Other impacts on your bottom line: Reduced house cleaning cost and an increase in the recycling of chips because they are clean and dry. Coolube is as good for your shop as it is for the global environment. Its non-toxic formula is safe for workers and will not cause dermatitis. We have small trial bottles available if you would like to check it out- send us an email with your address and application and we will send it out at no charge.